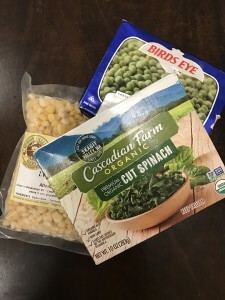 Straightforward frozen vegetables without added sauces can cut meal prep time (think frozen spinach instead of washing, chopping and cooking freshly bought greens) and bring variety to a meal without excess waste. If you don’t routinely use leftovers, everyone in your family likes different veggies, or you want to provide more than one per meal, it doesn’t get easier than cooking frozen vegetables. To prepare, take a bowl of veggies, add a small amount of water and microwave for 30 seconds to two minutes depending on the amount you have, and before your 5 minute couscous is done your veggies are on the plate. For a child size portion your can pour steaming hot water on them to defrost them, steam them or boil them. Two benefits to frozen veggies – they keep longer than fresh ones and may be even more nutritious as they’re frozen soon after harvest. Plus, they don’t have any added salt or calories from a sauce and are a blank slate for the flavors of your meal.